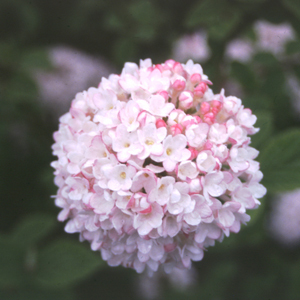 This Koreanspice viburnum cultivar is a compact, slow-growing, rounded, deciduous shrub which typically matures 3-4' tall with a similar spread. Pink buds open in spring (early April in the St. Louis area) to sweetly fragrant white flowers which are arranged in snowball-like clusters (hemispherical cymes) to 3" across. Flowers give way to non-showy, berry-like drupes which mature to blue-black in late summer. Broad ovate, serrate, dark green leaves (to 4" long). Foliage usually turns dull red in fall, but may sometimes display attractive shades of wine-red to burgundy.